You of course never really know what you are going to get when an executive from a big name company is a keynote speaker at a major industry event. My experience is that such presentations generally are delivered at pretty high level, and in the end don't really tell us a whole lot - in part because they are just too scripted. I am sure that usually comes from lots of "help" from corporate communications, investor relations, the lawyers, etc. So I had tepid expectations before a presentation by Bill Nienburg, VP of Global Merchandise & Sales Planning at Under Armour, at the Logility Connections user conference in Atlanta two weeks ago. My radar, it turns out, was well off in this case - this was a fantastic, almost in your face presentation (in a good way) that in effect said: "This is where our supply chain is headed, and how it is an core element in driving rapid growth. See if you can catch us." I love that - it simply says "We are playing to win." There is a level of supply chain energy and ambition here that is not common. Under Armour the company is of course quite a story, and its rapid growth continues. It hit $2.3 billion in sales in 2013, and expects to grow another 22% in 2014, on its way to being a $4 billion company in 2016 and $10 billion by 2020. Since it went public in 2005, it has had a cumulative annual growth rate of 31%. That's a lot of sneakers and work out gear for sure. Nienburg came to UA from Sara Lee and before that Procter & Gamble, by way of Georgia Tech. He said that early on at the company, he had a meeting with his team, and told them "supply chain collaboration was going to be a core competence" at Under Armour, referring to both internal and external collaboration - and let me tell you that objective is very real. As basic as that goal sounds, I don't believe I have ever heard anyone say they were going to make collaboration a core supply chain competence. At many companies, it's more like a core incompetence, right? Where does your company stand on the collaboration excellence scale? More on this below. Under Armour the company was built on the idea of speed in terms of its products and now its growth, and it has built a supply chain to match that velocity. You simply can't have a high-velocity product and growth strategy without the supply chain operating at the same clockspeed. The company is obsesses in a good way on making fast decisions. "Speed is the order of the day," Nienburg said. And that recognizes that along the way, some of those decisions will be wrong. "We want to make fast mistakes," he said. The formula for growth at Under Armour - and maybe most everywhere - is growth equals speed x innovation, Nienburg said. The key point and challenge is how you combine speed with control and predictability. Can you achieve all three? Few do today, I would argue. Again, I have not heard anyone state the mission quite like this before. I don't have any magical approach for getting to that place, but it is clear Under Armour has this as a defining mission, and something they are aggressively combining people, process and technology to achieve. Part of that is a detailed, integrated planning process, made more challenging (as for all apparel companies) by the notion of seasons: Spring/summer and Fall/winter. I don't have room for details here, but Under Armour is planning five such seasons at some level at any given time, obviously with increasingly levels of granularity the nearer-in a season is. Nienburg used the analogy of jets landing on an aircraft carrier to explain these multiple planning horizons. The current season is a plane approaching the runway - it is double checking to ensure nothing has changed with the existing plan prior to its landing, and then focusing on execution of the landing and monitoring feedback loops. But behind that plane is another that will land in a few more minutes. That's the following season. Others are entering the air space, etc. - but all five planes are being planned and tracked simultaneously. Ok, so back to collaboration. Nienburg said he was going to give the audience something of real value to take back, and he did. 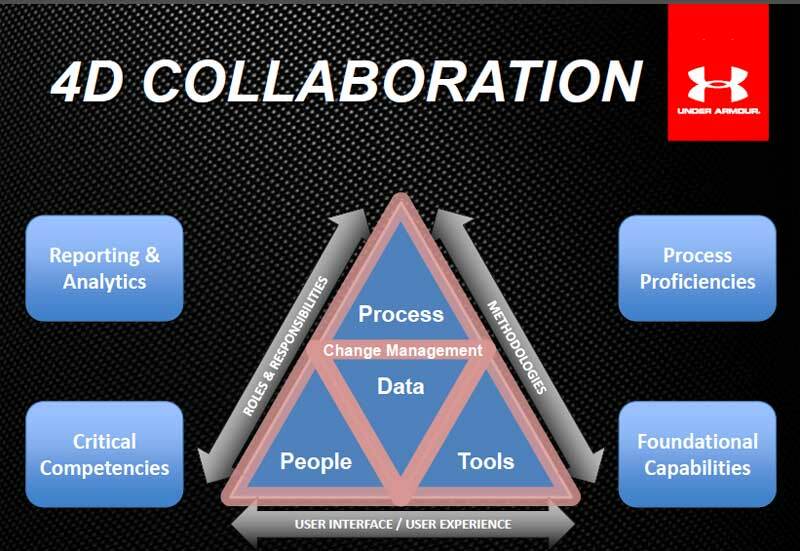 It is Under Armour's collaboration model, which Nienburg called "4D Collaboration," as shown in the graphic below. Here is what is different about this model - it puts "data" at its center. Neither internal nor external collaboration will work without accurate, timely and granular data, Nienburg said. So that is where UA started its collaboration efforts, by investing in the data (master data management, data governance, etc., along with tools to leverage the data) that its sees as the foundation of collaboration competence and excellence. When the barriers to effective collaboration are mentioned, the discussion usually starts with things like "trust" and "benefits sharing" and "processes" - maybe all of those and more are in the end largely symptoms of a lack of data. The other elements in the model are basically people, processes and technology (tools), but I think Nienburg added some excellent additional insight to those common elements. As just one example, UA has defined the critical competencies its people must possess to execute the level of collaboration and supply chain excellence it wants to achieve (moving targets, by the way, as it progresses down various maturity models). It then builds skills development and training programs to ensure its staff has those critical competencies. Nienburg reports to chief supply chain officer James Hardy, by the way - I am sure he deserves much of the credit for all of this too. The executive team is fully on board with this supply chain strategy. Nienburg said that in the last seven quarterly earnings calls the company has held, the supply chain planning system (Logility) that Under Armour has deployed as the technology foundation for its supply chain excellence has been referenced as a key component of the company's strong results. Nienburg cited a number of goals Under Armour had for its supply chain, but I especially liked this one: "We will outperform our competitive set for quality; speed to market; reliable, compliant supply; flexibility; and cost competitive products." To an extent, UA is the US version of Europe's Zara. This all said to me it's time for more companies to get into supply chain game shape at the highest levels of the sport. What do you think of Under Armour's supply chain thinking? Should more companies make supply chain collaboration a core competence? Let us know your thoughts at the Feedback section below. Interesting story and a trend that I see across industries as both the need for speed becomes more critical and the capabilities of the technology allow for greater visibility and collaboration. UA, however has some distinct advantages, owning design and the production all the way up to and sometimes including the retail stores. Fashion apparel has always been challenged by long supply chains that chase cheap production while having to make commitments to produce far ahead of retail demand signals. Anything they can do to enhance the connection from actual demand through to DRP and production orders will pay off. It is fantastic to see a rapidly growing company understand the impact and ability supply chain has in growing top line! Kudos to the entire Under Armour leadership team for recognizing this skill set and the ability of the supply chain team to contribute beyond moving trucks! The key to any successful campaign (combat or retail markets) is the supply chain and logistics pipeline. Lots of competitors have great products, but the ability to anticipate and respond quickly to customer demands and expectations is crucial. Without a true understanding of the full end to end supply chain (production to customer deliver), an organization will never maximize its true potential. Nice job Under Armour! We're finding more and more apparel and footwear companies are considering their supply chain a key component of their financial results and are depolying technologies to provide their business users with analytics and visualizations. James Hardy and Bill Nienburg are playing pro-ball!